As I'm sure you all know by now (and if you don't, pay attention to this post! 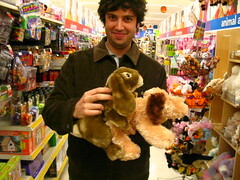 ), 2005 would not be complete without one more NYC visit from my favorite new band "discovery" of the year, The Changes. I know that I have prattled on endlessly about how much I love this band and how worthy they are of your attention, but honestly people these guys are the real deal and they are going huge places -- the band just confirmed that they are playing the opening gala of the Sundance Film Festival! But before they go and rub elbows with the big wigs and sip hot cocoa with Lindsay Lohan, the band will grace NYC with three great shows. Here are the details -- and also please note that the first show is my crazy not to be missed holiday party. See you this weekend! Saturyday, Dec 17th @ Mercury Lounge with Tralala, Palomar, The Rinse and Bound Stems (also from Chicago and also awesome! ), set time 10pm. HERE ARE SOME SONGS THAT I ACTUALLY HAVE NEVER POSTED!